Adds style-awareness to text transformation. Is there a better alternative to TextSoap Menu? Is TextSoap Menu really the best app in File Management category? Will TextSoap Menu work good on macOS 10.13.4? TextSoap Menu needs a rating. Be the first to rate this app and get the discussion started! 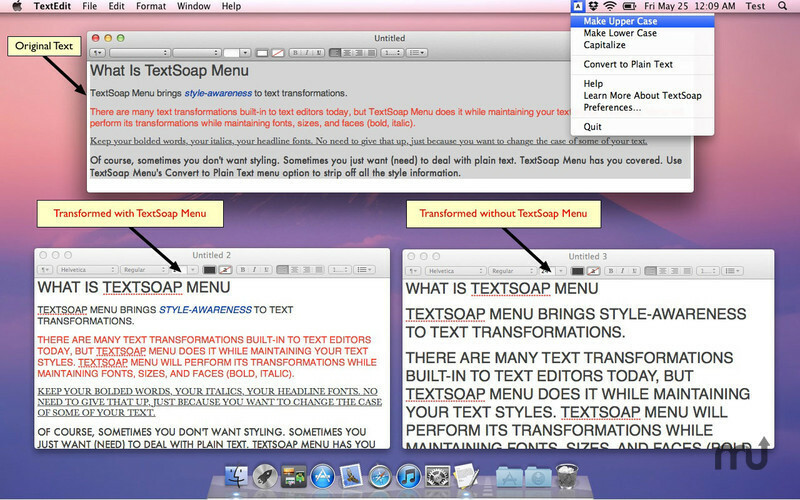 TextSoap Menu brings style-awareness to your text transformations. Now you can change text case and keep your font information intact. Keep your bolded words, your italics, your headline fonts. No need to give that up, just because you want to change the case of some of your text. Of course, sometimes you don't want styles. Sometimes you just want (or need) to deal with plain text. TextSoap Menu has you covered there too. Use TextSoap Menu's 'Convert to Plain Text' menu option to strip off all the style information. TextSoap Menu works with text selected in your favorite applications, or use it to change just the current contents of the clipboard text. Link to TextSoap: If you have TextSoap installed, TextSoap Menu can also (optionally) tap into TextSoap's features. Get complete hierarchical menu access to TextSoap cleaners to use in other apps as well as hot key actions to apply cleaners or display custom popup menu of cleaners.